With phone spammers becoming more and more of a nuisance, technology developers have been working hard to combat the problem. On the iOS platform, Apple introduced an API called CallKit which gives third-party developers the ability to develop and extend the iPhone’s ability to identify and block these unwelcome callers. A growing trend is for Threat Actors (a fancy way of saying scammers, spammers, and criminals in general) to spoof their Caller ID. A favorite technique is to spoof a number in the same ‘prefix’ as the intended target. So, if your number is 305-555-1212, the TA will spoof his Caller ID to be 305-555-1294. You may think this is a legitimate call, since it’s in your phone’s ‘neighborhood’. 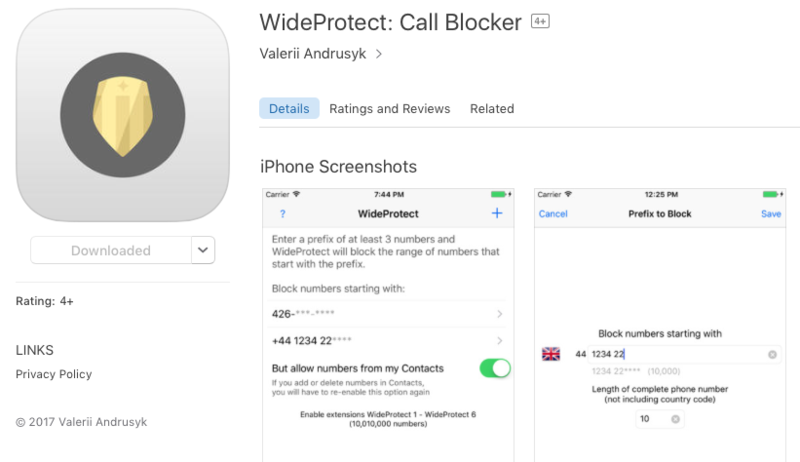 An app developer has released a great tool called WideProtect. This allows iOS users to block entire prefixes from calling them. So, in my example from above, you could instruct the app to block all caller from 305-555-xxxx. It even allows you to whitelist numbers in your designated prefixes from your contact list, in case you have legitimate contacts you don’t want to block. This is a welcome addition to the CallKit framework, and I highly recommend you give this app a try. Other great apps in this category include Nomorobo, Hiya, and Truecaller… among others.